In a world where fiction about God is presented as fact and where lies often overshadow the truth, we need a fresh reminder from God’s Word to strengthen our faith. The New Testament includes four “postcards”—short but powerful—that help us stand firm in what we believe. The postcards—Philemon, 2 John, 3 John, and Jude—address some of the most important issues for Christians today, such as forgiveness, generosity, and discernment, as well as the foundational tenets of our faith—the person, work, and supremacy of Jesus Christ. 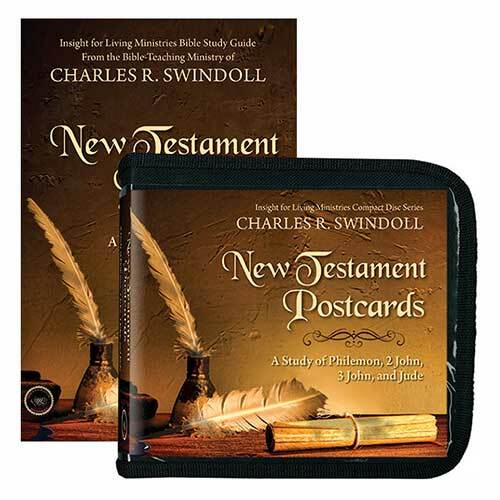 Join Chuck Swindoll as he shares the hope-filled message of grace through Christ contained in these postcards. The New Testament Postcards: A Study of Philemon, 2 John, 3 John, and Jude CD series will prepare you to better understand and live out your faith. Copyright © 1977, ℗ 2014 by Charles R. Swindoll, Inc. All rights are reserved worldwide.